Welcome everyone! So glad to be back with you for another episode. Today we’re talking about breaking up. No, this isn’t with your significant other of anything of that kind. But I am talking about a relationship and it’s time to sever the knot. I’m referring to your relationship with FEAR. I know you have one. We all do. But I’m betting it’s not one that you look upon fondly. In fact, when you think about it, you probably tense up and start feeling a queasiness coming over you. See, this is what I’m talking about. FEAR. If you want to know why you’re not doing more of what you want to – even like, having a difficult conversation or just telling people the truth. Maybe it’s getting out there more and talking to people or raising your hand and sharing your opinions, or it could simply be going somewhere – what stops you – every single time – is fear. 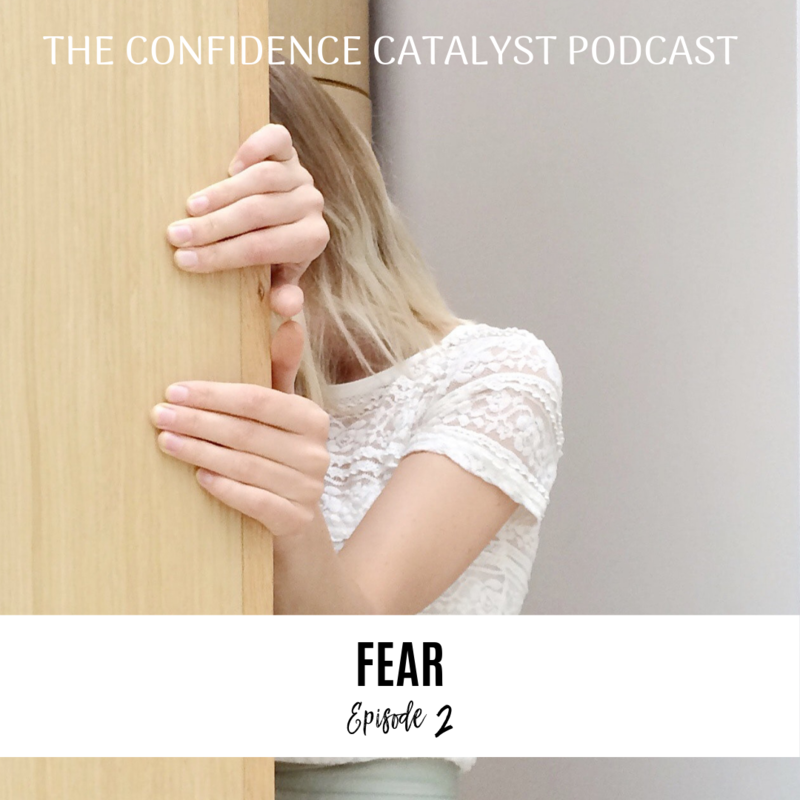 Fear is a prominent part of life and this episode will offer you tools to help you keep going, keep moving, keep growing. So first, there’s two different kinds of fear. There’s the fear that is a biological, that automatic/stimulus response kind of fear. This fear is amygdala-based – the kind of fear like when someone jumps out at you in the dark and you have a response. Which I have a funny story about that one. When my husband and I were first married we lived in a tiny one bedroom apartment which was perfect for us but the light switch was by the front door so at night when you turned off the lights you had to navigate around all the furniture and hope you didn’t stub your toe on the dinner table, the couch, or trip over shoes on the floor. So turning off the light wasn’t ever fun. That and to be honest I was still afraid of the dark – oh the things that stay with you from childhood, right? Anyway, my new husband thought it’d be funny to hide behind the door and grab my ankles – did you just gasp? I know you did. You already know where this story is going. So when I got to the door and something grabbed my ankles my automatic, biological-amygdala based fear kicked into full gear and I just full out swung in the dark and knocked him so hard in the side of the head. We laugh now and he says that the next thing he knew was that he was seeing stars. It’s been almost 18 years later and he’s never tried that stunt again. It’s not as funny when it’s your sweetheart vs your younger sister, right? I’m sure we all have our experiences with that automatic fear right? That bypasses your thoughts. That fear needs to bypass the reasoning portion of our brain. It’s different than someone grabs your ankles in the dark and you’re not going to go, “Hmm..someone is grabbing me. I should try to escape.” It’s like, automatic, SWING in the dark reaction. That’s not the kind of fear which is not what we’re talking about today. We want to talk about the fear that we have full control over. We are talking about the fear that we create in our minds. It’s the fear that something might be wrong with us. The fear of sharing our story with others because it could be open to judgement. The fear that people might be mad at us. The fear that we could hurt them or that they could hurt us. It’s this kind of fear we’re going to focus on today. Because it’s this fear and our relationship to this fear that can prevent us from living the kind of life we really want to live. It acts as a powerful motivator to stay where you are, to not advance forward, to not try something new, to stay stuck and small because it believes that small is safe. Not speaking up is somehow safer than rocking the waters of showing up authentic. But all this fear isn’t serving you. It’s keeping you from progressing. Notice in both of those definitions it’s caused by a thought. When you THINK you are in danger or when you THINK something unpleasant might happen or maybe it already did happen. The did happen part is fascinating too – we feel fear AFTER an event. Something like, “I shouldn’t have said that. I shouldn’t have done that. I shouldn’t have told them how I was feeling. What was I thinking? Now they’re going to be mad at me or not like me. Right? The common denominator in both examples – fear that something MIGHT happen and the fear that something MIGHT HAVE ALREADY happened is that FEAR is a THOUGHT. This is important to know because THOUGHTS create how we feel. Your thoughts create your feelings. So if you’re feeling afraid or experiencing FEAR for anything, you can know that it’s because of something you’re thinking. Some story you’re telling yourself. Believing that something uncomfortable might have happened or that something did happen. Hence the anxiety butterflies cluster up, our heart starts rapidly POUNDING in our chest, our face gets hot and before you know it, this irrational fear is in full swing. Let’s talk about that for a second. I really encourage you to write out your fears. Make a list of 20-25 top fears. Really think about it too. What creates fear for you in your life – and again, we’re not talking about people jumping out at you in the dark. – I did tell him he’s never going to live that down because what was he thinking?! But really, what creates fear for you in your life? Fear of talking about certain things to people, fear of public speaking, fear of heights, fear of rejection, etc. Write out a whole long list. We have lots of fear so you’ll have plenty to write down. Now what I want you to do is notice that there are two subcategories of this kind of fear – rational fear – like, yes, this is real, could happen any moment. I’m in the jungle and there really are deadly animals out here that could legitimately jump out and get me. Then there’s the irrational fear. This is what the vast majority of our fears are. This is the fear that is illogical. Me being afraid of snakes is pretty illogical right now since I’m not in a position where I’m around snakes ever. Seeing a snake in National Geographic magazine is safe. It can’t jump off the page to hurt me. Me thinking, I’m afraid of snakes in this capacity is illogical. It’s a waste of my thought energy and time. The fear that I feel is because I create a story in my mind that brings up all these thoughts and FEARS is irrational and created completely in my mind. Go through your list and write out whether it’s rational – this could be eminent – I literally could be in trouble. This is the Hunger Games kind of thing. Vs the Irrational that our brain just cooks up a story where it THINKS you’re in the hunger games but really you’re at the family dinner. Which I know some of you feel like it’s a version of the Hunger Games but it’s not. It’s an irrational fear. They’re really not tigers. You’re really okay. Notice on your list how many of your fears are completely irrational. Fascinating, right? When we think of fear we tend to go right to bad. Fear = bad – something bad, we don’t like it but today I want to offer you a new perspective. I’m not averse to feeling fear. Fear is a feeling and a part of our mortal journey. We’re supposed to experience and feel the full spectrum of emotions. This includes feeling fear. Think of this. We think and talk about courage like it’s a good thing. It’s honorable, nobel. But for courage to exist – fear had to be present, yes? For me to feel proud that I overcame something means that there was a struggle – there was a FEAR that I might not succeed and so then I employ COURAGE and conquer and become stronger. But I can’t have any of that if fear wasn’t present. Fear doesn’t have to mean something bad like how we normally associate it. It does not automatically mean that something is wrong. Fear isn’t something to avoid. Fear is just a feeling. Listen to this, friends – FEAR is a feeling. And feelings are just vibrations in your body. When you look at in that light it’s not that scary. Here’s something wild to think about too. Dr. Jill Bolte Taylor says that feelings stay in our bodies in 90 second cycles. We have a thought, it triggers a feeling, it cycles through for 90 seconds. Crazy, right? I know, I know you’re like, no. I feel it WAY longer than that. The reason it gets prolonged is because you have yet ANOTHER thought that starts the cycle all over again – again and again and again. But you don’t have to. When you think about it in terms of a 90 second vibration in your body – it’s really not that scary. It’s not as big of a problem as we originally thought. The real problem comes from what we’re thinking and the story we’re telling ourselves. Most of us fear fear. We fear what we think fear will feel like so we go to great lengths to avoid that feeling only creating more fear. Think about this for a moment. A lot of us experience some levels of anxiety when we go to have a new conversation with others. It’s not that having that conversation is scary. It’s the FEAR created because you’re worried about what they’ll think, what they’ll say, how they’ll react, if you can handle what they respond with. You’re feeling fear even before you’ve done anything. You don’t want to have that conversation because it could be scary. Notice – COULD BE – it’s not even a given – we fear the potential that something could be uncomfortable. So instead you don’t do anything because you’re already feeling the fear of what could be a fearful experience. It’s not even the fear from pressing forward. It’s the irrational, self created fear. But here’s the thing, you’re feeling fear already. You’re fearing what could happen and what could happen might be scary so you think you’re staying safe but you’re still creating FEAR. Crazy isn’t it? So your options are to feel the fear and do it anyway or to avoid, resist, ruminate and feel the fear of the idea that it could potentially be scary. Why not just do it? You’re feeling fear either way but in the first one you’re moving. You’re taking action. You’re employing courage and the opportunity to be proud of yourself for overcoming. When you’re just spinning and not taking action you’re still feeling fear but you’re not going anywhere. 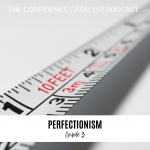 You’re bypassing the potential for courage, for triumph, for showing yourself what you’re capable of because I promise you – you are capable of so, so much. Fear in and of itself is not the problem. It’s your relationship to it that is. 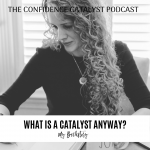 This episode is called the break up because you need to break up with this kind of fear – the fear of fear – the irrational fear that you’ve been letting call all the shots, the fear that keeps you small, and stuck, and quiet. It’s time to redefine the relationship. It’s time to kick it out of your house, off your couch and treat it as an employee. Something that works FOR you, not against you. Let’s pause for a second and talk about fear and our primitive, natural man minds. Fear was a necessity for a time. It actually served our primitive friends quite well. Fear kept them safe. There literally was danger around every corner. There really could be tigers lurking about hungry and ready to pounce for their next meal so our primitive brain is wired to be afraid. Fear kept them safe and always on the lookout because it needed to be. But it doesn’t know that it doesn’t need to take on that role anymore. One of your brain’s main jobs is to keep you safe. It looks out for danger and tries to protect you from potential threats. Which was necessary then but now, not so much. It doesn’t quite know the difference between a tiger that’s about to pounce or dinner at your in laws. Fear starts kicking in and you think all kinds of potential, what if’s…What if it’s uncomfortable? What if someone teases me? What if they think badly of me? What if they think I’m not good enough? What if I say something ridiculous and they laugh at me? Fear, fear, fear…So your natural man says, stay home. Don’t go. Run back to the cave, hide, take cover – death could be imminent! So the next thing you know you’re finding excuses of why dinner really isn’t going to work out. Running away from the perceived threat instead of taking the action you want. Irrational fear. Check in with yourself. What do you WANT to be doing. If fear weren’t a part of it – what would you want? So notice what you’re doing then. Staying home, staying in bed, staying under the covers isn’t getting you closer to any of those wants. You’re staying small and stuck. Your self generated fear is keeping you limited. You’re not giving yourself an opportunity to employ courage and opportunity. I remember this one time we took our family to Disneyland and one of my kiddos did NOT want to ride the Matterhorn. It looked scary. It was going to be fast. You can’t even see half of it from the outside because it’s inside a mountain. There was all this mind drama and the more they stewed and thought and ruminated and over thought about it, the more fear they experienced. But listen, right there in the long, long, long line on concrete, in the warm sun, surrounded by family. They were safe. Nothing was imminent. They were safe. But they were in all this emotional pain because of the storyline in their head. The most painful and terrifying part of the entire experience was the irrational pain they put themselves through before they even stepped foot on the ride, right? How often do we do this to ourselves? We worry and fear ahead of time what people are going to think of us. Are they going to make some comment about me, are they going to judge me? Are they going to be judging how I look and see how big I am, how tight these jeans are? So we talk ourselves out of it – whatever IT is. We create fear for ourselves all.the.time. When we do this we’re so focused on what we think others are going to think, we’re not thinking about what WE WANT to think about. We’re so set on believing what our fears and insecurities tell us that we can’t see even the slightest HINT of possibility that it could be amazing. That YOU are amazing. That the way you LOOK is amazing. One of my sweet clients had this fear of looking stupid in front of others. She was so afraid of what others would think of her that it inhibited her from even getting up on Sunday and bearing her testimony. She didn’t want to walk up there fearing that all eyes would watch her walk up the aisle, seeing her not favorite side of her and then even just the thought of sharing something so close to her and so vulnerable that what if they thought she didn’t have a deep enough testimony? She’d look ridiculous. Maybe she’d say the wrong thing? So each month when testimony Sunday came around she had that burning to get up and share her light but those doubts, those insecurities, that fear stopped her and so she sat there feeling all the fear in her safe row, surrounded by her family. But inside her heart was pounding and racing. He cheeks flushed, her hands started shaking. All that fear created by the THOUGHTS that she was choosing to hang on to. This is when fear is a problem. When you feel fear and you make it mean stop. FEAR is a feeling, right? Just a vibration in your body created by a sentence in your mind. Pause and take a quick inventory. What’s happening around you? Where are you? What thoughts are you entertaining? Is the fear rational or irrational? Are you letting it STOP you? Are you willing to hide your light because of a sentence in your mind? Or are you going to invoke courage? Are you willing to feel the fear and do it anyway? Here’s the thing, we fear the unknown. We ask ourselves a lot of what if…questions. But we never answer them. This is a mistake because when you don’t answer it you’re just creating more of the unknown and then your body is going to respond to that with even more fear, right? Answer all your questions and then ask yourself, SO WHAT? What’s the WORST that can happen? You fear that they’ll think badly of you – so what? You can be amazing and they still might think badly of you. You can’t control them so it’s best to give up even the slightest hint that you ever could. It’s a losing battle and who cares what they think? Really, who cares? They can’t hurt you. I promise you, they can’t. Is your fear rational? Are they going to attack you? Probably not. You’re just creating this fictional story in your head and you need to stop that, interrupt it with rational questions. What’s the worst that can happen? The worst that can happen is that you feel a feeling. You might feel another vibration in your body created by a sentence in your mind. whoop-de-do, right? Actually the worst that can happen is that you didn’t even try. The worst is that you’re choosing to be inauthentic and hide your light because you fear the idea that they might not like you, accept you, think highly of you – judge you – and so what if they do? If they do, they’re probably not your people, and that’s okay. More than likely because you decided to go for it, people ARE going to like you, they’re going to LOVE you. But you’ll never know that if you’re too preoccupied with your irrational, fictitious visions in your head. You’re too busy creating fear ahead of time that you miss knowing if in reality it was scary. Either way you’re feeling the fear, you might as well feel it and actually know what could have been instead of just feeling disappointed afterwards and wondering. Fear invites courage. Courage invites accomplishment. Accomplishment invites the reality of creating something that wasn’t there before. A new friendship, a testimony that maybe that one person really needed to hear and no one can say it like you can. Maybe it’s a performance, a new job, an evening with friends, a conversation, trying a new class at the gym, going to the gym even. Whatever it is, I invite you feel the fear and do it anyway. Is what you’re fearing something you REALLY want to do? Something that means a lot to you but fear is getting in the way? Notice the fear and press forward anyway. It’s a good sign that what you’re about to embark on is going to be truly significant to you and meaningful in your life. The more fear, the more courage, the more courage, the prouder you’ll be of yourself when you overcome it. Feel the fear and do it anyway. You can totally handle fear. Especially irrational fear. Expose it for what it is. Break up with the dominating fear that wants to keep you from fully living. Redefine that relationship. Make it work for you instead of against you. Jack Canfield always says, “you weren’t given a dream unless you have the capacity to fulfill it” – in other words, you wouldn’t even be given the idea, thought, dream unless Heavenly Father already equipped you with everything you needed and then some to accomplish it. That’s exciting, right? There’s this song that I love by Francesca Battistelli called, The Break Up Song – and don’t misunderstand – she’s not breaking up with someone – she breaking up with FEAR. Go check it out because it’s awesome. Sing it with her. Sing it loud, belt it in the car, memorize the lyrics. Sing it to yourself every single time fear starts poking it’s little head out. It’s powerful. It’s inspiring and it’ll help you remember who you are and what fear is. “Is there anybody out there just like me? And I ain’t got time for you telling me what I’m not like you know me, well guess what? Oh, I so wanted to sing it but I didn’t want you to get distracted so next time – we can sing it together. We can belt it out loud together. Fear, you will never be welcome here. Breakup with the dominating, irrational, keep you stuck relationship with fear and embrace that fear can be your friend. Redefine the relationship. You can feel the fear and welcome courage and do it anyway because you are strong. You are brave and you can be free. Feel the fear, do it anyway because that’s the kind of person you are. Alright, have a courageous week my friends and fill me on how you’re doing with this! I’d love to hear from you! And as always, I’d LOVE a review from you so if you have 1 minute I’d so appreciate that. Thanks guys! See you next week!